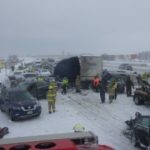 The release of some of the 911 calls for a major pileup on Interstate 41 at Neenah demonstrates just how helpless those involved in were. One woman was frightened and inconsolable as she watched others crash into surrounding vehicles. The woman then exited her vehicle as the dispatcher pleaded with her to get back in her vehicle. Then her line went dead. Thirty-year-old Andrew Schefelker of Oshkosh was killed and 71 people were injured in the biggest traffic accident in the state’s history. The person killed in Sunday massive pileup on I-41 at Neenah has been identified. Winnebago County Sheriff John Matz identified the man killed as 30-year-old Andrew Schefelker of Oshkosh, a teacher with the Iola-Scandinavia School District. During a Monday press conference, Matz also said that the multi-vehicle pileup appears to be the largest in state history. Despite the chaotic situation, Chief Deputy Todd Christopherson said many things went right. “Within two hours, we essentially had everybody diverted from that location, all people into a warming center, and all people into a hospital. The massive chain reaction in the southbound lanes of I-41 at Neenah involved 131 vehicles and injured 71 people. Investigators are still working out exactly what happend. Whiteout conditions in eastern Wisconsin have caused a fatal series of highway crashes. Over 130 vehicles crashed into one another in the southbound lanes of I-41 near Neenah on Sunday. At least one person is dead and over 70 others were injured. Sections of the interstate were completely shut down and rerouted as rescue crews moved in to get all of the injured off the roads and to safety. Over 500 other vehicles that were stuck behind the crash had to be moved and rerouted. The Winnebago County Sheriff’s Office reported that I-41 southbound was opened back up as of 3:00 a.m. Monday. State utility regulators will investige whether the contractor that caused a fatal explosion in downtown Sun Prairie last summer broke state law. The Public Service Commission’s investigation will ask if V-C Tech broke state law — by not calling Digger’s Hotline before starting to install fiber optic lines last July 10th. The resulting explosion destroyed five buildings, damaged many others, and a killed firefighter. Federal regulators have already fined V-C Tech and Bear Communications. Sun Prairie police found there was no criminal wrongdoing. No criminal charges will be filed, in connection to the July natural gas explosion in Sun Prairie which killed firefighter Cory Barr. Sun Prairie Police Chief Patrick Anhalt read a brief statement during a press conference Thursday. Anhalt said “incomplete and inaccurate information was exchanged and relied upon” before the blast, by contractors and subcontractors on a fiber optic cable project. But he said that the investigation by his department, the state fire marshal’s office, the Dane County district attorney’s office, and the state attorney general’s office “concluded that there is not probable cause to believe a crime was committed.” The investigation is now classified as inactive. As cleanup continues across Dane County in the wake of this summer’s floods, the discussion now turns on how best to prevent a flood in the future. Richard Lathrop from the UW-Madison Limnology department says simply lowering the levels on Lake Mendota during the summer months won’t help during the next flood event. He says treating the Yahara Lakes simply like a reservoir is the wrong approach, and that more needs to be done by opening channels in the lower lakes, as well as improving flood mitigation in general across Dane County. Dane County crews were out in force during the flood opening up channels on Lakes Mendota and Monona, working to clear out weed blockages. Water levels are still above where they’d normally be at this time of year. Green Bay Packers quarterback Aaron Roders is stepping up, to help with wildfire relief in his native California. Rodgers tweeted a video on Wednesday, in which he requested others to contribute. “Raising money for both immediate needs and the long term recovery is what’s needed now,” Rodgers said. Dozens of people have died and hundreds remain unaccounted for in the Camp Fire, the most destructive in the state’s history. “In northern California where I was born and raised, the city of Paradise burned to the ground and many of the residents who got out are now displaced in my hometown of Chico and across the north state,” Rodgers said in the tweet. UPDATE: The driver accused of killing three Girl Scouts and a mother is being held on bond. 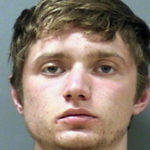 Twenty-one year-old Colten Treu faces charges of vehicular homicide in the deaths of 9-year-old Jayna Kelley and 10-year-old Autum Helgeson, and 10-year-old Haylee Hickle and her mom, 32-year-old Sara Jo Schneider. Treu, who allegedly told Lake Hallie police that he and a passenger were “huffing” before he struck the Girl Scouts with his truck, is being held on $250,000 bond. The Girl Scout troop was picking up trash along a road on Saturday. A fourth girl is in stable condition at a Minnesota hospital. UPDATE: Police say driver of a truck which plowed into a Girl Scout troop in Chippewa County over the weekend was “huffing.” Killed on Saturday, 9-year-old Jayna Kelley and 10-year-old Autum Helgeson, and 10-year-old Haylee Hickle and her 32-year-old mother, Sara Jo Schneider. A fourth Girl Scout is in critical condition. The Eau Claire Leader-Telegram reports that Lake Hallie police said 21-year-old Colton Treu and a passenger told investigators that they were inhaling chemical vapors before striking the Scout Troop as they picked up trash along a road. Treu was being held in the Chippewa County Jail on 13 possible charges, including four counts of intoxicated use of a motor vehicle, Chippewa County Sheriff’s Sergeant Robert Jensen said Treu was expected to appear for a bond hearing at 10:00 a.m. Monday. A driver who struck a group of Girl Scouts in Chippewa County, killing three of them and an adult woman, will face four homicide charges. He’s identified as 21-year-old Colton Treu of Chippewa Falls. Lake Hallie Police Sergeant Dan Sokup said the girls were picking up roadside trash, just before noon on Saturday, when they were struck by a pickup truck that crossed the center line. Treu left the scene but later turned himself in. A fourth girl remained in critical condition as of Sunday. The three girls killed attended elementary school in Chippewa Falls.